Courtesy of Jenny Adler. Shot with the Canon EOS 6D Mark II DSLR. Everyday, millions of Floridians walk atop a massive aquifer, living and going about their lives directly above a complex layer of earth that supplies their drinking water. 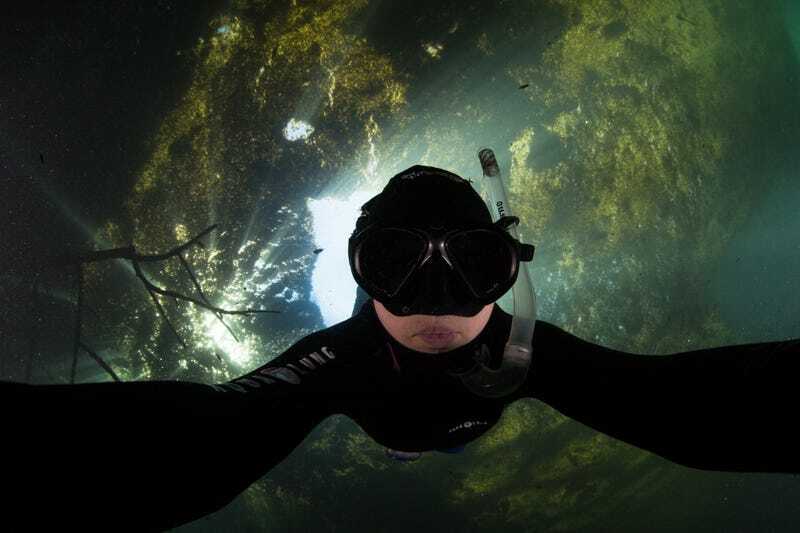 Not many people know what it’s like to swim in the 1,000 freshwater springs that the aquifer feeds. Even fewer know what it’s like to dive deep into the system of underwater caves and tunnels that comprise it. One of those people is Jenny Adler, and she does it all with a camera in hand. We challenged her to shoot the most otherworldly photos she could, using the new Canon EOS 6D Mark II DSLR. But first, we spoke to the marine-biologist-turned-photographer to ask what it’s like capturing the world beneath our feet. Studio@Gizmodo: You’re a biologist, a cave diver, and a photographer. Can you tell us more about your background and how you got into that line of work? Jenny Adler: I originally was trained as a marine biologist, and I did my undergrad at Brown. After I graduated, I moved down to Gainesville, Florida to work as a biologist for the US Geological Survey. Because of that fieldwork, and because of Gainesville’s proximity to tons and tons of springs, I ended up starting to swim in a lot of them, jumping in them to cool off. And I became really obsessed with them. Photography at first was a way for me to share the springs with my family back at home. But as I started to really research them, I started noticing that they were actually degrading and full of a lot of algae. I started documenting that with my camera as well. It’s through photography that I started to communicate about the ecosystems to people who didn’t normally swim in them, and who also spent their lives living on top of the aquifer. How does your scientific background influence the way you take photos? Studying science has informed my photography in that I know how to both read scientific papers about the research that’s happening at springs and also how to communicate with the scientists that are conducting the research. I’m able to ask them questions, understand what their process is, and really be able to give an accurate voice to the science through photography. Once I’m underwater, I’m very much in a different creative state of mind, but having done my research and understanding the importance of that research is something that definitely carries over into my photography. Can you describe that creative state of mind? What’s your process like when you go out and shoot underwater? Underwater is where I’m the most comfortable. I think that’s a huge part of what makes me able to really get into that creative state of mind. I always want to synthesize research that I’ve done and to envision which shots I think I want to get at a location beforehand. But the minute I get in the water, I’m overtaken by this other dimension. The water is so clear that it feels like you’re almost flying, and when you swim all the way to the bottom of the spring, you can often look up and see the treetops. It’s kind of a world that doesn’t seem to make sense from the outside, but when I’m in this world, I feel a lot more creative. Even on an early morning, the crisp, cool water makes me feel very awake. There are these really magical reflections beneath the surface, and curious manatees and fish will often swim right up to you. It’s unlike anything that can happen on land. A big part of my mindset is this space that I’m in — feeling weightless and free underwater. What kind of underwater environments help you achieve your best work? One of the biggest things is water clarity. A lot of times, the best ocean pictures you’ll see might be from a tropical environment where there’s really clear water. A lot of the best light in the springs happens in the morning and evening – in the middle of the day the sun is often too intense as it beats through really clear water. Also, being in an ecosystem where you’re being really conscious of your surroundings and not stirring up the bottom or scaring things. What do you hope to capture when you’re shooting? What makes a photograph successful for you? If I’m shooting a science story, my main goal is to take images that do justice to the science and communicate it in a way that people can understand and connect with. For taking other images, I try to evoke the feeling of being underwater in the picture. You might look at it and almost feel like you’re pulled into the ecosystem. If you’re skilled at photography and storytelling, you can tell a story with a single image and perhaps suggest a certain message without using words, which let’s the viewer come to the conclusion on their own. Whether I’m jumping into a place where thousands of Floridians have been before, or jumping into a place that is way off the beaten path, I hope to capture that location with a very unique perspective and with a unique twist so that you might see a new place in a new way, or see a familiar place from a completely different perspective. How do you stay inspired and constantly creative in your photography practice? What really drives me to get out and keep shooting is a passion for the places that I’m photographing, and the drive to want to capture and document them because they’re threatened and endangered. The ecosystems are fragile, and they’re changing over time. You really can’t jump in the same spring twice, because species and vegetation shift seasonally. I’m always trying to go out and make my images better and tell a meaningful story. There are always ways to get fresh perspectives on it. A lot of that is talking to different people, continuing to read the scientific research, and continuing to look at other photos, so that you can see what you do and don’t like about other people’s pictures and even your own photos in the past. Can you share some of your photo equipment must-haves when you’re in the field? I like to shoot with a 15 mm fisheye lens (such as the Canon EF 8-15mm f/4L Fisheye USM). It gives me the ability to do capture both close-focus and wide-angle shots, because you can focus right up to the dome and also have a wide field of view. For underwater shoots, I also need a lot of light, so having at least two strobes is essential. When I go down into caves, I need a lot of off-camera lights, because it’s completely pitch black. Having other people with me, especially in the cave environment, is really important, because I rely on a lot of teamwork with other people. There’s a lot of planning ahead where lights are going to be stationed, and what we’re going to do once we’re underwater. The other thing that may seem super obvious is the need for an underwater housing for the camera. The DSLR itself isn’t waterproof, so the camera housing is essential. Do you have any advice for budding photographers? If you can get to know your camera like the back of your hand and really understand how to use it as a tool in your work, it will serve you incredibly well. Get a camera with an interchangeable lens and learn to shoot it in manual mode. You don’t need to travel the world to take amazing photos; you can do it in your own backyard. And then, for underwater photography, make sure you’re super comfortable in the water. Get really comfortable free-diving, and always be aware of your surroundings. If you’re diving, continue to check your air and always keep safety in the forefront of your mind, even if it means not getting “the shot.” It can get dangerous really quickly if you’re not aware of not only what you’re doing with your camera but your life support equipment as well. A lot of my work has looked at the decline of vegetation in the springs and its replacement by algae — but I understand that vegetation isn’t always the most compelling angle for a lot of people. So, I’m telling the story of the springs through turtles, because the the Santa Fe River is home to a huge percentage of all of North America’s freshwater turtle species. I’m also working on continuing the Walking on Water program that I started that put cameras in the hands of kids and immerses them in the springs to learn about their vital freshwater. *Stay tuned for a follow-up post showcasing Jenny’s work with the Canon EOS 6D Mark II DSLR. Angela Wang is a Senior Writer for Studio@Gizmodo. This post is a sponsored collaboration between Canon and Studio@Gizmodo.